Save 10% Off the List Price if Items Sold Separately! We have combined the following products into one convenient pack - about a 1-2 month supply. 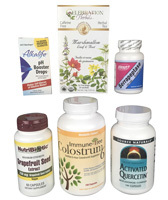 These supplements have been shown to be effective in supporting interstitial bladder health. A unique bioflavanoid derived from plant sources, Activated Quercetin™ is an advanced dietary supplement the can promote bladder health. This formulation is used by healthcare professionals worldwide as nutritional support for promoting a healthy bladder.